Rebel Legion :: View topic - A belated welcome to our newest Tusken Raider! Posted: Thu Oct 04, 2012 3:18 am Post subject: A belated welcome to our newest Tusken Raider! I've had the pleasure this evening of chatting on Facebook with a recent new member, George G, who joined Rebel Legion right after Dragon*Con. George is also a member of the Georgia Garrison and hails from the Athens area. And I see he has a sense of humor b/c he lists his character's occupation as "Bantha Poodoo Miner/Trader". I assume this is due to his affiliation with the Agricultural Department at my favorite university (um, Go Dawgs) located in his sector. Anyway, welcome George, and we look forward to trooping with you! If you are not already a member, you are eligible to join the legion-level "Wretched Hive" alien detachment here http://www.rebellegion.com/forum/viewtopic.php?t=10114&postdays=0&postorder=asc&start=0 and then affiliate with our local "Tibanna Storm Clan" here http://www.rebellegion.com/forum/viewtopic.php?t=42681. We are just getting started with our local clan, so it's a good time to jump in! Thank you SO MUCH for the warm welcome! I look forward to meeting everyone in person soon! OH! and I am not actually affiliated with the ag school. I'm actually going back to college to be a nurse! My characters occupation is more of a shout out to my capability to both take and give poodoo when needed. That proves you have a sense of humor .. and I was just putting in a plug for my favorite university with the Ag School and Poodoo thing. And I'm glad to hear you really *are* going there and especially for an important career that's much needed. 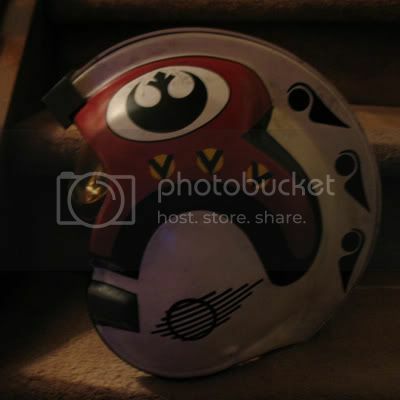 Pssst..... my pilot bucket.... and yes, that's Bulldog Red. Welcome George! Great tusken costume!